A recent work day began with me donning a hard hat and getting painting instructions from college student Karalyn Henry. Not my typical work day at The Greater Cincinnati Foundation (GCF)! Lori Beiler hard at work. 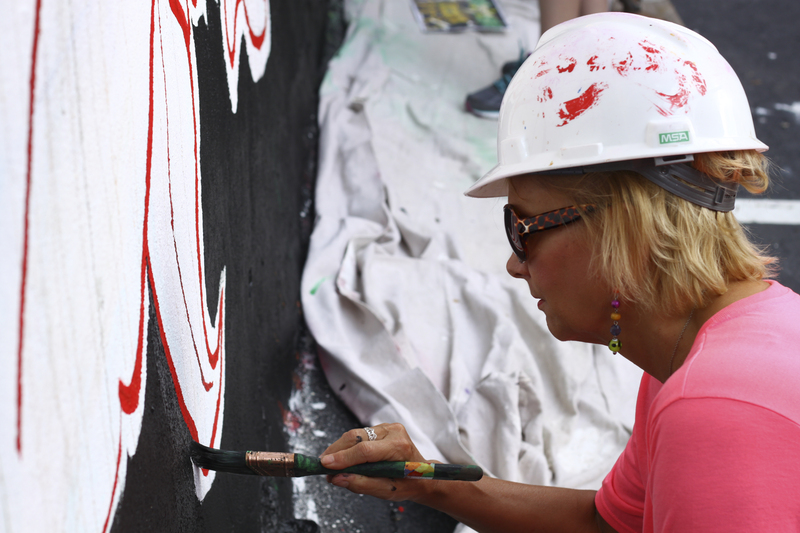 My colleague, Lori Beiler, and I were fortunate to spend a morning working on murals with ArtWorks apprentices as part of an event to allow donors and funders to take part of mural creation. 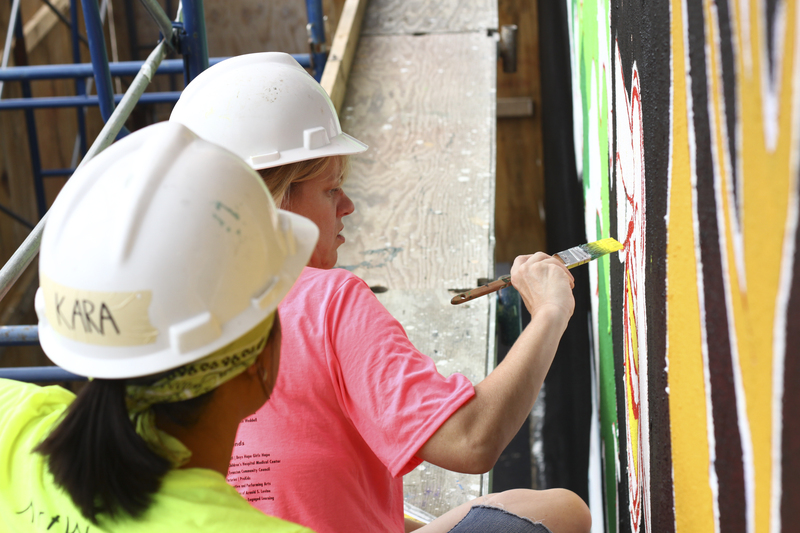 As I climbed two flights of scaffolding to work on the Sycamore Street mural, Kara calmly gave me directions, asked me questions, and told me about herself. Kara directing Julia on mural making. Working on the mural was fun, but what really stuck with Lori and me was how impressed we were with these young future leaders. 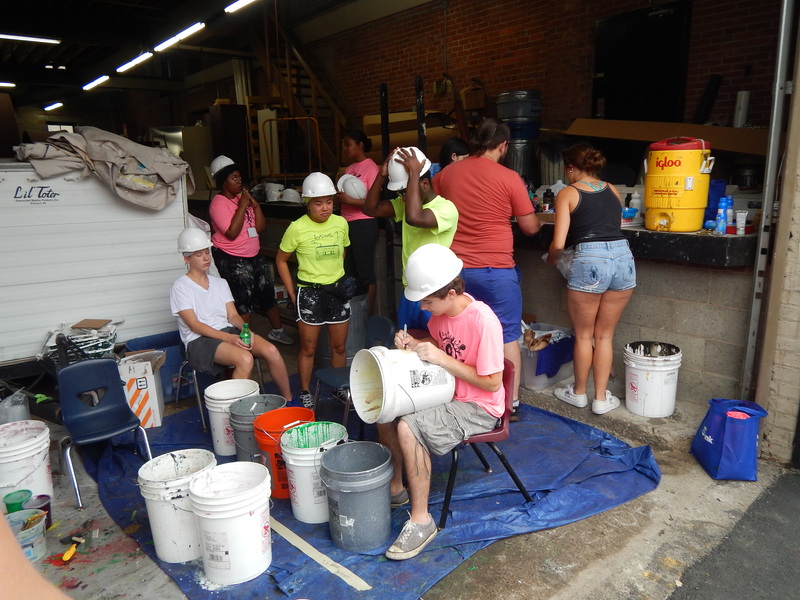 Since 1996, ArtWorks has been providing life-changing summer employment experiences for Cincinnati’s youth through the creation of community-based art. By painting murals, youth not only hone their artistic skills, but gain valuable work experience and life skills. More than 500 youth apply for the 200 available positions each summer. It was obvious the group we worked with was top-notch. They were well-spoken and confident with adults as they became our “bosses” for the day. Lori was as impressed with Ahustin Crawford, a college student, as I was with Kara. The apprentice group we worked with was diverse in age, schools, neighborhoods, and interests. The group ranged from 15 to 21. There were high school students from DePaul Cristo Rey and Mother of Mercy High School, and college students from Northern Kentucky and Xavier universities. One apprentice told me how surprised she was that the group not only worked well together but became friends, despite their age differences. 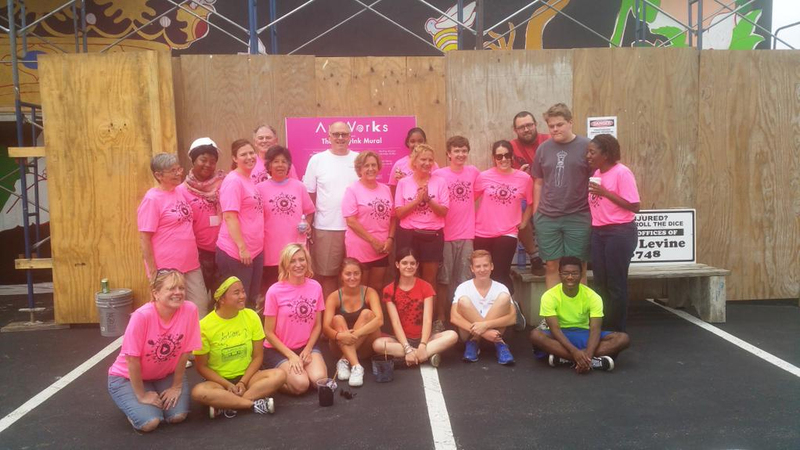 GCF supports organizations like ArtWorks because they contribute to a more thriving and vibrant community. ArtWorks uses the arts to foster community and foster youth leadership. Our generous GCF donors love ArtWorks. They granted more than $200,000 to the organization in the last year and a half, and GCF was able to grant an additional $100,000 recently to ArtWorks. The mural Lori and I worked on represents this summer’s CincyInk project, supported by a $50,000 GCF grant. ArtWorks’ CincyInk is an interactive, citywide celebration of love for Cincinnati, manifesting itself in the form of a community-created poem, tattoos, and urban art installations. We thank these apprentices—our future leaders—for contributing to the beauty of our city. The next time you drive past the Horseshoe Casino, check out “The Queen Shares Her Crown” mural that Lori, Kara, Ahustin, and I got to work on. We paint some mean bumblebees. 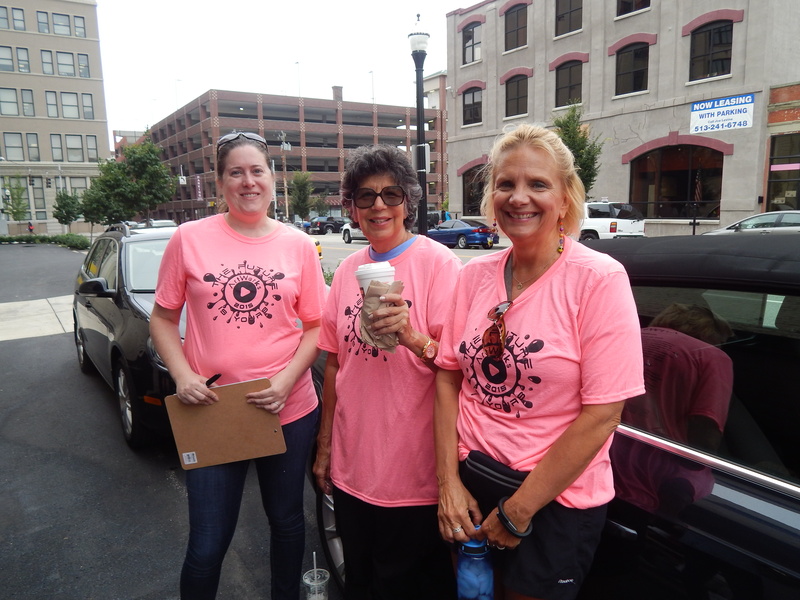 Our ArtWorks crew – volunteers and apprentices. Julia Mace is the Senior Communications Office of The Greater Cincinnati Foundation.